Your kid (or you) might not be able to create these amazing Thanksgiving centerpieces and projects with Legos that were featured on Apartment Therapy, but they might provide fantastic inspiration for you to put a little DIY and STEM fun into your holiday decorating. 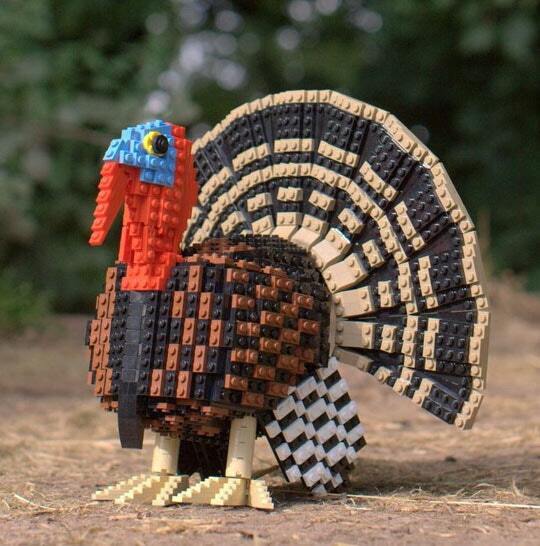 You’ll find amazing Lego turkeys like the one pictured, Lego pie and more. Maybe you can challenge the kids — and everyone else — at your Thanksgiving table to fashion their favorite part of the meal out of blocks. Or try making Lego leaves, pumpkins and other symbols of the season. Then put them all together to decorate your table. To get you started, here are the instructions for a classic Lego build: the Lego turkey dinner. Talk about playing with your food! Engineering and turkey all in one day? What could be better?